One year ago, on my quest for a healthier, chemical free life, l learned the truth about Parabens and how they effect us, inside and out. I quickly trashed hundreds of dollars worth of products, not feeling a tinge of guilt, until it came to one: “Laura Mercier Tinted Moisturizer”. It’s like the Holy Grail of makeup, leaving your skin flawless and positively glowing. I was so peeved about having to let this one go, that I actually sat down and wrote a letter to the company, begging them to keep the same formula while removing any trace of parabens. I was totally shocked when I received a response from the president the very next day exclaiming excitedly that they were in the process of doing just that, and understood my concern! WOW. Seriously? Major kudos for the response time alone. Unfortunately, it would take months before the newly formulated product hit the market, so in the meantime, I had to search….. and search…. and search for something just as fabulous, and totally natural. Cut to Holy Grail Senior: “Josie Maran Argan Oil Tinted Moisturizer”. Holy perfect, flawless, even coverage loaded with amazing organic ingredients. Not to mention, “Butter” was a perfect color match for my winter white skin. Downside: There are only four shades, but they are all lovely. In the summertime, I am “Linen”, just a shade darker, giving me a nice summer glow. The Argan Oil alone makes this product super moisturizing, but it’s also thick enough for thorough coverage. Evens out the skin beautifully. If you don’t live in a dry climate, like Cali…. and you’re in a hot, humid climate, like my home state of South Carolina, this is likely to be a little too moisturizing. If this is the case, and you prefer powder to tinted moisturizer, I highly recommend “Mineral Fusion” powder from Whole Foods. 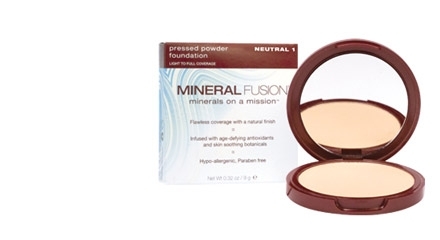 This is the BEST powder makeup I have found to date, and it’s loaded with antioxidants and minerals. Never cakey. In the meantime, while browsing Nordstrom’s the other day, I headed over to the Laura Mercier counter to find out if they ever did change the formula of my previously fave product. I was beyond thrilled to see the new, Paraben Free version of America’s number one selling tinted moisturizer. I smiled a very big smile. The world is changing, one beauty product at a time. So please, take the time to learn about the toxic ingredients in the products we use daily….. It can literally save your life. Kukui Cocoa Body Butter Latte Anyone? laura mercier’s tinted moisturizer is definitely the best out of any that i’ve tried, BB cream is also really great to use if you’re not a fan of foundation but need some extra coverage. unfortunately,Laura Mercier’s tinted moisturizer ingredient list has not changed..it still has parabens……..
Octyl Methoxycinnamate and Menthyl Anthranilate. Purified Water, Cetearyl Alcohol (and) PEG-40 Castor Oil, Dimethicone, Polyglyceryl-4 Isostearate, Cyclomethicone, DEA-Ceryl Phosphate, Hexyl Laurate, Tocopheryl Acetate (Vitamin E Acetate), Sodium Dehydroacetate, Sodium Hyaluronate, Allantoin, Carbomer, Methylparaben, Magnesium Aluminum Silicate, Sodium Ascorbate (Vitamin C), Propylparaben. May Contain: Titanium Dioxide, Iron Oxides, Mica. I just bought this tinted moisturizer a few months ago! The coverage is perfect since everything else seems too heavy. Would you say the Josie Maran tinted moisturizer is heavier than Mercier’s? Would you recommend it for combination skin? Yes Alyssa! The Josie Maran tinted moisturizer is definitely heavier with more coverage than the Laura Mercier. Love both, but use Laura more! I am using argan oil bulk for many days. I really got nice result using this. Thanks for finding thing Lin! OMG thank you for this post! Been dedicated to LM tinted moisturizer for 15 years but can’t stomach the Parabens any longer! Also in love with the new Tarte tinted moisturizer. All in the ingredients! But I still use LM when I’m feeling like a little glow!